Arunika Subba and Palash Mandal* Department of Botany, Plant Physiology and Pharmacognosy Research Laboratory, University of North Bengal, Siliguri, West Bengal, India. Introduction: The powder mixture of the two species of Asparagaceae (Asparagus filicinus and Asparagus officinalis) was found to be used traditionally for the treatment of heart palpitation in west Sikkim. Objective: Pharmacognostic characterisation was carried out for the authentication of the powder drug which included powder microscopy, fluorescence analysis and physicochemical characterisation. The presence of any therapeutic potential in HP was also determined by qualitative and quantitative estimation of phytochemicals along with free radical scavenging activity of various successive solvent extracts (based on their polarity). Thin layer chromatography (TLC) of the powdered HP was also done. The standard software SPSS (ver. 15.0) and XLSTAT 2009 (Addinsoft) and Smith’s Statistical Package were used for different statistical analysis. Results: Powder microscopy of HP revealed the presence of calcium oxalate crystal, tracheids, stone cells etc. Various fluorescence colours were exhibited by HP on UV after reacting with different chemical reagents. The analysis values were also obtained in a satisfactory way. TLC and qualitative phytochemical analysis revealed the presence of some active phytoconstituents. Among all the solvent extracts, acetone, heptane, ethyl acetate and benzene extracts showed higher antioxidant potential. 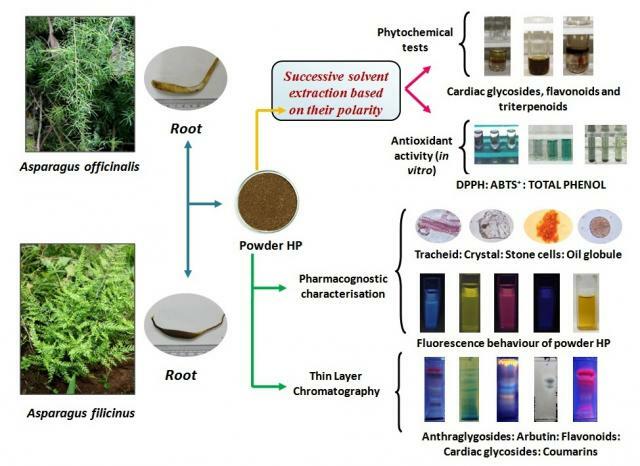 Conclusion: The results support the use of HP as a traditional medicine and further purification should be done for the identification of bioactive phytoconstituents responsible for its antioxidant activity. Subba A, Mandal P. Pharmacognostic Studies and In Vitro Antioxidant Potential of Traditional Polyherbal Formulation of West Sikkim with Asparagus Spp. Pharmacognosy Journal. 2015;7(6):348-355.